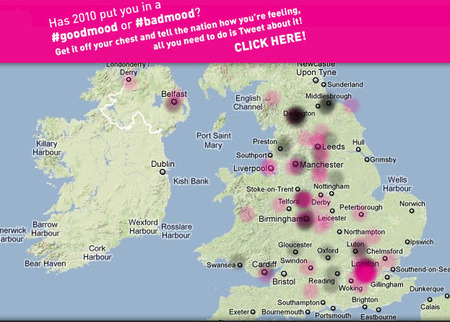 Lastminute.com have created a Twitter mood map for the UK. Like the snow map, which superimposed mentions of the word “snow” on a map of Britain, this links up mentions of the words “good mood” and “bad mood” with the location of the tweeter – either their town or their postcode. Good mood is pink, bad mood is black. You can see from the screengrab below that the result is smudges of pink and black according to which places people are happy in. Hover over the smudge and the orginal tweet comes up. Lastminute suggests you make sure your tweet goes straight to the mood map by adding the tag #goodmood or #badmood and locating it by including the first half of your postcode as well. But the widget behind the map seems to pick up tweets mentioning good/bad moods regardless of whether you officially tag them or not. Got to say that when you zoom into street level the location is a little inaccurate… so a tweet about Bethnal Green in East London is tagged at somewhere near Croydon in the south, and even when the postcode is included things still go off by a few miles. Still, we’re splitting hairs, this is pretty fun. A stream along the bottom of the page shows the tweets as they come in and there’s a banner ad at the top for lastminute.com’s deals – and the suggestion that you would probably be in a better mood if you had just booked a city break to Amsterdam. Results so far: in London people really do seem to be pretty happy. Other cites in a good mood are Liverpool and Leicester. Manchester and Birmingham are mixed while Darlington and Middlesbrough seem to be a bad mood. Anyone from up there? How are you feeling? yes it’s lastminute’s but i’m sure that would be fine. Would you kindly allow me to use this image in my presentation?